This is possibly one of my most anticipated books of 2013. I LOVE, LOVE, LOVE Shadow and Bone. It was beautiful, and conflicting, and creative, and lush, and romantic, and thrilling, and seductive. And the Darkling? And Mal? And that ending? Amazeballs. I’m super duper, undeniably, fangirly grabby-grabby-grabby hands for this one. I seriously can’t wait for this book! I’m stalking the internet for any kind of news about this book. I need a title…I need more Four…more Tris…I NEED to know what the heck is going on outside Chicago. October, why are you so far away? Oh-ho-ho MAN. YES. I need both of these books like NOW. I’ve been trying to win an ARC of Siege and Storm like you wouldn’t believe, but no luck so far. Hopefully my sister will just get one from the publisher like she did for Shadow and Bone (I swear, she gets ALL the books!). Cheers! Both of these are amazing choices! I am dying to get my hands on them as well! Absolutely YES for Divergent #3, my most anticipated read this year! I will try Siege and Storm but I didn’t love Shadow and Bone so I’m not sure if I’ll enjoy it. YES and YES!!! I’m going to BEA and I bought a ticket to the author breakfast that Veronica Roth is attending. My dream is that we’ll get copies of # 3, but it may be too soon for that. 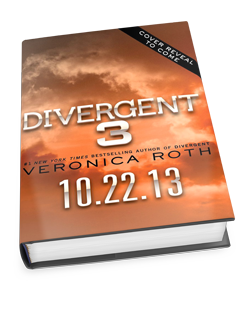 Is it really going to be titled Divergent #3? Or haven’t they released the title yet? I hope it’s a little more creative than that. Haha… I hope so too. No, they just are keeping the title under wraps for now. Hopefully we’ll have a title soon. Siege and Storm was fantastic — I think even better than S & B. And, yeah, what we all wouldn’t do to get our hands on D3!!! 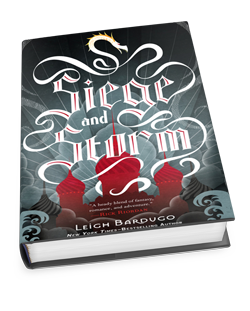 Siege and Storm is simply amazing, and eve better than Shadow and Bone. Of course, I’m dying for the final book in the Divergent series. Love the world Veronica Roth created. Great pick! Can’t wait for either of these books!!! I am a little worried about Siege and Storm because Shadow and Bone ended beautifully. Insurgent fell below expectations. Still, can’t deny that I am really counting the days until they are both released. Those books! Those books I SEVERELY want! I haven’t read Shadow and Bone and Insurgent, though. I’m totally being left behind! I hope I can get to them soon! Woohoo yes Siege & Storm! !